Today’s children, perhaps even more than adults, realize the importance of making the transition to clean sustainable energy. After all, it is not only our present, but their futures, that are being affected by rising prices and the environmental damage caused by the use of coal, gas, and oil. That’s why it’s a good idea to involve the whole family in the discussion about making a transition to solar energy. Experts in child psychology all agree that the more information children have and the more they are encouraged to participate in life changes, the less likely they are to have negative reactions. Solar energy installation is no exception. It’s a big event in any family’s life. 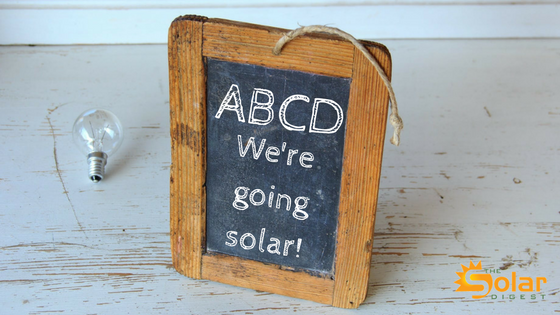 Educating your children about solar energy before the big event can make it even more exciting and rewarding. There are a few online tools that can help prepare your children for the installation of a solar energy system in your home. Educating them about solar energy today can result in their making smart energy choices when they are older. In some cases, it has even inspired young people to invent new devices that have improved thousands of people’s lives. For example, one young man dreamed of providing a clean source of electric light for his grandmother. She, and everyone in their village, had to rely on smoky kerosene lamps. By 2004, he had succeeded in providing solar lamps to 15,000 people, changing tens of thousands of people’s lives. He then set a new goal to provide 100,000 lamps by 2015. For younger children, solar toys can be a fun and interesting way to learn about the science of solar energy. Using the solar panels found inside simple inexpensive solar lights, children can build a number of things, including their own solar-powered robot. Because solar lights are self-contained, there are no electrical wires to deal with, which makes it safer and easier. For older children, there are a number of kits available which provide hands-on scientific experiments that can teach children how solar energy works. They will learn about inverters, the devices that convert direct current (DC) electricity to AC (alternating current) to be available for powering appliances and electronic devices. These kits can also help raise their awareness of just how much energy is needed to power specific devices. Some 2014 studies revealed that the number of electrical appliances that the average family uses has doubled just since 2000. Considering all the new gadgets from vacuum cleaners to virtual reality machines invented since then, the number in 2018 is probably even higher. If you have children, the number can be staggering. Smart phones, tablets, and electric toothbrushes have become as necessary as washers and dryers for most families. The average home has approximately 70 items that need to be plugged in, and every one of them increases your family’s monthly energy bill. Having your children count the number of gadgets they have and learn the amount of energy each uses allows them to participate in deciding how many solar panels will be necessary to accommodate your family’s energy needs. On the big day of your solar energy installation, your children will know not only how many solar panels will be installed, but how much energy they can generate. Whatever type of system you choose, whether it is a rooftop system connected to the grid, or a more sophisticated off-grid system that utilizes batteries, watching the installation from a safe distance can be a fascinating learning experience for children. Once your solar energy installation is complete, children can also participate in maintaining the system. Solar panels are stationary and have no moving parts, so no mechanical maintenance is necessary. However, the panels do need to be kept clean. It’s estimated that simple dust buildup can reduce system production of electricity by up to 7 percent. Studies show that solar panels cleaned once a year produce 3.5% more electricity, while those cleaned twice a year produce 5.1% more than those that aren’t cleaned periodically. Clearly, a professional should be called if the level of cleaning required involves getting on the roof. However, children can use a simple garden hose on them occasionally to keep dirt from accumulating. This is especially true in the case of ground level solar energy installation, which can often more effectively maximize the amount of available sunshine in colder climates. How often your panels should be cleaned depends on a number of factors, including whether the panels are flat or tilted. In many geographical locations, once or twice a year is sufficient. In places with more pollution and less rainfall, they may need to be cleaned more often. Investing the time to involve your children in the process from start to finish can make your solar energy installation experience one that will reap rich dividends for years to come. Some of those dividends will be financial, and come in the form of reduced monthly energy bills. Others will be social and educational, as your children share their learning experiences with others. One of humanity’s most necessary learning experiences has been that no amount of money can buy clean air and water. That’s why perhaps the most valuable dividend you can earn by investing in a solar energy system is the knowledge that you have helped ensure not only their futures, but their children’s futures as well.